Flat roofing for commercial buildings has been around for quite some time, and it still has a place in today’s business community. 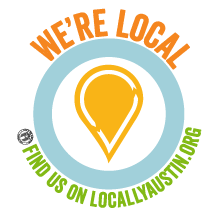 In Austin and its surrounding cities, they’re being installed as effective, inexpensive and durable roofing options for building owners. They have a unique architectural look, they’re easy to repair and replace and often used along with sloped roofs. Flat roofs work well in the warm, dry and sometimes windy Texas weather. Flat roofing systems use less roofing area compared to pitched roofs, which can have as much as double the total area of a flat roof. They also do a great job of absorbing heat during warm days, which helps to insulate the interior of buildings as well. In warmer areas, every cooling opportunity is helpful in lowering utility expenses. Commercial flat roofs have certain requirements and needs. Unlike sloped roofs, which rely on gravity to shed water and material, flat roofs depend on drains and rely on a water resistant membrane to protect the owner’s building. The term ‘flat’ is a little misleading — no roof is completely flat or water would pool on top of it. “Low slope” is a better description of what’s commonly called a flat roof. Flat roofs need to have at least a 1/4 inch of slope per foot (or more) so that water can flow downhill to the drains and then off the roof and down to the ground. There are four main types of flat roofing. and we’ll go over the pluses and minuses of each. Single ply membranes are made of rubber, plastic or a combination of both. Single ply membrane is applied in a single layer. Installation is simple: roll out the membrane, heat weld the seams between the sheets, chemically weld them or glue them together, then the membrane is attached to the roof with screws/flat plates, ballast (like rocks) or adhesive. Modified bitumen is made of reinforced asphalt impregnated felts. Unlike built up roofs, the asphalt in the felts is modified with plastic or rubber polymers to improve flexibility, durability and overall performance. Because of the polymers, modified bitumen can be applied in a single layer and overlapping the seams. They’re then glued to the roof with hot asphalt or an adhesive, or by using torches to melt the asphalt underneath. Some modified bitumen roofs require protective surfacing materials, usually mineral granules or a liquid coating. Built-up roofing (BUR) is what is often called “hot tar roofing.” Its an old, time-tested method. Built up roofs are made of three or four overlapping layers of asphalt felts which are fused together by hot asphalt. They have to be protected from extreme weather, sunlight and people walking on it by some kind of surface material like gravel, a mineral granule top layer (a cap sheet), a coat of asphalt or a some type of special reflective coating. Foam is sprayed straight onto the roof, where it “foams up” and hardens before a protective coating is put on top. Because of its flexibility, foam is especially good for roofs with unusual shapes and configurations. Foam has several unique advantages over other types of flat roofing systems. It protects against thermal shock and it can greatly reduce your energy bills. 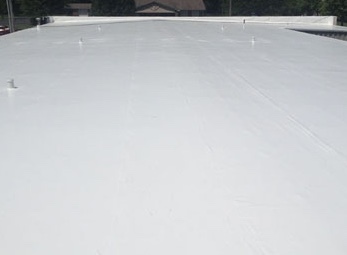 Commercial flat roofing often has a white layer on top. It helps to keep the sun and its heat under control. The white coating also expands and contracts as temperatures rise and fall. This helps your property’s temperatures down, so you enjoy a cooler environment and lower energy bills. Flat roofs have basic problems and challenges. As an example, drainage can be the biggest problem if they don’t have the correct slope. A drainage issue will lead to leaks and mold. Watertight seals are utilized to solve this problem. Plastic or rubber can also be used to provide a leak-proof flat roof. Another option to avoid this issue is to use some pitched roofing along with the flat sections, because no one wants water pooling on, in, or around their building. You must use proven methods and materials to ensure that your flat roof is installed and then maintained well. 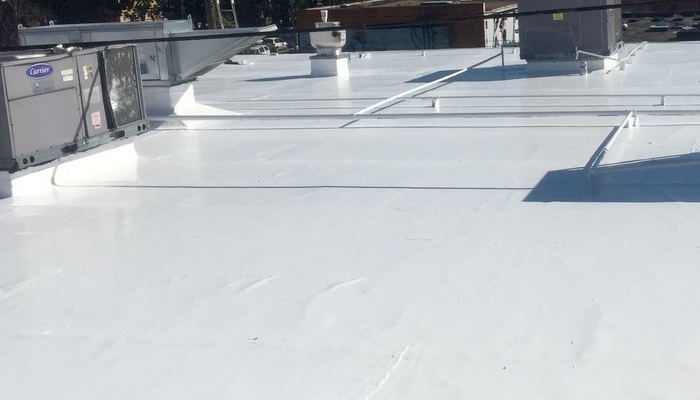 The maintenance of flat roofing on a commercial building is another factor often cited by property managers and building owners trying to decide on a roofing system. Some choose against installing a flat roof for their property due to being misinformed. While there are some legitimate concerns, we believe the key is to use the right materials, installation procedures and methods for installing the roof. Here at Armadillo Roofing & Exteriors. we provide commercial flat roof repair, commercial flat roof replacement and commercial flat roof installation in Austin and all the surrounding communities. We make sure your roofing system is professionally installed, which includes choosing the highest quality and most suitable materials. We then plan the roof installation based on your property, construction preferences, and budget. If you’re interested in professional commercial flat roof installation or repair, give us a call at 512-333-7663.